Financial Planning is a crucial component of our life. But, building a good investment portfolio seems to be a tedious task especially for beginners. 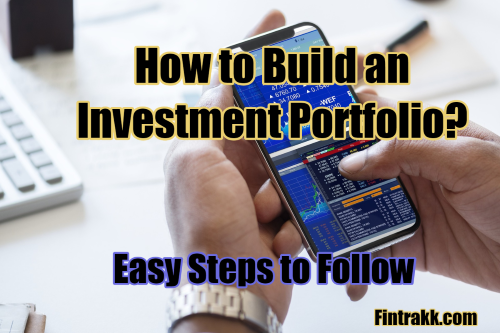 So, here we though of sharing some easy steps on How to build an Investment portfolio to derive maximum profits from the market? If you think life is the most unpredictable thing, invest in the share market. One day your shares might worth millions, and the next day they might drop down to cents. People lose and make money in seconds. But then again, it is one of the fastest ways to make money and if you plan it well, certainly worth the risk. In today’s world, its rightly said that a well-maintained portfolio is essential to any investor’s success. By portfolio here we mean, a collective group of your investment; be it share market, mutual funds, SIP, bonds, or any such investing option. There are various financial instruments in which you can invest your money in depending on the amount of risk you want to take. Before investing, just remember that a good investment portfolio should not only be based on your future requirements but on your comfort zone too. The various available options in the market are a great opportunity to combine the aggressive and conservative approach together. Balancing your portfolio would not only give you maximum profits but peace of mind too. Now, if you’re thinking to start investing your money, keep the following important points in mind to churn the maximum profits. Almost every investment is a good investment, provided you don’t put all the eggs in the same basket. Stocks usually pay off, if not in short run then definitely in the long run. But you can’t survive if you put all your money in the same place. Sometimes, it takes years for money to grow, and you can’t sit idle until it starts giving you profit. So, no matter how good the company is, never invest your everything in it. Rather study the market and invest in various profit giving firms. That way your returns won’t be tied to just one company. Know your market before you invest. See the previous graph of the stocks you’re thinking of buying. Its gain-loss frequency will tell you how stable the stock is and how much can you trust it. The amount of trust you can put will determine the amount of money that you should be investing in. The higher the frequency of its stock graph, more careful you should be. The frequency graph that we talked about can also hint the right time to invest. For instance, a construction company’s shares go up when taxes on building material are reduced and vice versa. Any change in policies which affect a firm directly will affect its share price. You just have to find the right time to invest in a company. Look for a firm which was at an all-time high in the near past but isn’t doing too well at present. If you study the graph well and are aware that the drop in its stock price is normal, then that’s the company you should be investing in. There’s a very thin line between gambling and investing. Don’t cross it. Maintain a certain bank balance and if you lose money in the market, never invest more until you save well above that bank balance. This will stop you from losing too much. Investment done in the right way hardly backfires but if it does, make sure your account isn’t lower than what it was when you invested the last time. That’s the whole purpose, right? To make ‘more’ money. While the stock market is a quick way to make money, it’s risky too. You shouldn’t invest all your money in the stock market. You can explore various investment options like SIP. The returns won’t be that high with SIP in the short run, but in the long run you can expect handsome returns. Thus, if you invest 50-50, on one hand, you’ll be making profits by taking calculated risks, and on the other, you’ll be having a cushion in case the risk doesn’t pay off. So, these are the five significant steps that will keep you in check. Your investments would be as risk-free as it can possibly be, and you’ll always have a cushion to land on in case things don’t go in your favour. Just know your limits and play according to it, and returns will follow. Profits made by investing in the market depend on the ongoing market conditions and may not be ample to finance your immediate personal needs. In case, you want to finance your personal goals like buying a car, going on a vacation, arranging the down payment of your new home or financing your own marriage; instant loans can come handy. Instant loans or personal loans are unsecured loans, meaning you don’t need to provide collateral when you borrow. Also, instant loans have lower interest rates than most credit cards, and you can use them for a variety of purchases. However, before you borrow, it’s always a good idea to consider a reliable financial institution that offers an instant loan with quick online disbursal and minimum paperwork. But, remember you should apply for a personal loan only when it’s required to meet your important financial needs and not for investing in risky asset classes like stocks. Disclaimer: Stock Trading is subject to high market risks. Please follow due diligence before investing your money. This blog is for information purpose only and can’t be constituted as a professional advice in any regard. Fintrakk.com or any of its representatives are not responsible for any losses occurring in Stock Trading. « Types of Stock trading in India: Which one is for you?